Early Decision — Should You or Shouldn’t You? Early decision application deadlines are fast approaching. Some are as soon as November 15, less than 3 weeks away! Many of you ask us whether you should opt for early decision. The answer is (of course) — it is entirely up to you! What does choosing to apply early decision actually mean? It means that you have decided that X law school is your top choice and that you would choose to attend that law school regardless of whether you were admitted elsewhere and regardless the amount of financial aid offered by your early decision school. More importantly, when selecting to apply via the binding early decision track you are agreeing that, if admitted to X law school, you will attend that law school and, therefore, will immediately withdraw all of your other applications at all other law schools. Some nearby schools with binding “Early Decision/Early Commitment” programs include: University of Michigan Law School, Northwestern University School of Law, University of Chicago Law School, and Indiana University Mauer School of Law. Binding “Early Decision” or “Early Commitment” programs should not be confused with non-binding “Early Action” or “Early Notification” programs like those offered by Chicago-Kent Law School and Loyola University of Chicago School of Law. Are there advantages to applying Early Decision? In most cases, the one key advantage to applying early decision is that you demonstrate to the law school a very strong interest in their program. Further, since you are applying early, you will hear from the admissions office much earlier in the admissions cycle. Finally, with regard to scholarships and financial aid, the impact of early decision varies from school to school. Many schools treat early decision candidates/admitted applicants the same as they treat those applicants applying during and admitted through the regular admissions cycle. However, other law schools offer financial incentives for qualified applicants to apply early decision. For example, in the case of Northwestern, if admitted through its Early Decision program, you are guaranteed a total scholarship of $150,000 ($50,000 per year). Note: if you are applying early decision to Northwestern you must complete an admissions interview ASAP. Click here to access information about scheduling an interview at Northwestern. So…should you or shouldn’t you? The decision to commit to a binding early decision program is a very individual one. Consider all of the pros and cons very carefully. If you decide it is the right approach for you, make sure you finish all required elements of the application by the stated deadlines. Good luck! This is an important update for all October LSAT takers who either: 1) registered for the December LSAT or plan to do so; or 2) registered for the December exam before you got your October score and now you don’t need to retake in December. You may be eligible for a refund. Whew. It’s been a busy time for the LSAC. They have changed their policy several times in the last week with regard to October LSAT takers. What happened: According to the LSAC, changes to their process of providing accommodations to LSAT test takers required them to move up the registration for December exams. The new registration deadline for the December LSAT was before October LSAT takers would receive their score. The LSAC decided to offer a refund for October takers’ late fees for the December exam. Then they released the scores early and decided not to offer a refund. THEN, they reversed that decision and decided once again to offer a refund to October takers for December registration fees. Who is eligible? Two groups of people are eligible for a refund. One: October LSAT takers who did not cancel/were not absent from their October exam AND who registered late for the December exam. These people are eligible for a refund of their late fees ($90). Two: October LSAT takers who met the regular registration deadline for December but upon receiving your score you have decided that you do not need to retake in December. These people are eligible for a refund of the entire LSAT registration fee ($175). Only October LSAT takers are eligible for these refunds. You must register and apply for a refund within 4 days after the November 3 late registration deadline (see instructions below). Late fee refunds: LSAC will honor requests for refunds of the additional late registration fee ($90) from candidates who chose not to register by the regular registration deadline for the December LSAT because they needed time to consider their options after receiving their scores from the October test. Candidates who took the October 2015 test and have a valid score will have until November 3, 2015 to register for the December 2015 test. Unfortunately, we are unable to waive the late fee upon registration; therefore, eligible candidates must submit a written request for a refund of the late fee within 4 days after the November 3 late registration deadline. Refunds will not be issued to those who were absent, cancelled their score, or were dismissed from the test. Requests should be emailed to LSACrefunds@LSAC.org and should include “Late Fee Refund” in the subject line. December LSAT withdrawal refunds: Candidates who registered by the regular registration deadline for the December LSAT after their October score was released, but subsequently decided they do not want to take the December test, will be eligible for a full test registration fee refund if they cancel their registration by November 3, 2015. Eligible candidates must submit a written request for a refund of the registration fee within 4 days after the November 3 late registration deadline. Refunds will not be issued to those who were absent, cancelled their score, or were dismissed from the October test. Requests should be emailed to LSACrefunds@LSAC.org and should include “Late Fee Refund” in the subject line. If you have questions about the refund, direct them to LSACrefunds@lsac.org. On behalf of our students and alumni, we have already communicated with the LSAC about preventing this situation in the future. October LSAT Takers – We Want Your Feedback! We are studying how Illinois students prepare for the LSAT. If you sat for the October LSAT, please take a few minutes to let us know what study method you used and how helpful you found it in preparing for the LSAT. Please take a moment to fill out a short questionnaire here. Are you applying to law school this year? This workshop will provide an extensive overview of the application process, including: Understanding the Credential Assembly Service (including a demo), letters of recommendation, transcripts, and the LSAC report that law schools receive. We will discuss how to develop a law school application strategy and share tips to maximize admission and aid in the law school application process. All of your questions about the law school application process will be addressed! No registration is necessary. This workshop does not cover the personal statement and law school resume due to the separate workshops on those topics. Attendees are invited to attend both workshops. The Real Deal: Lawyers Share the Inside View of the Legal Profession. Monday, Nov. 9 at 5:00 in 514 Illini Union Bookstore Building. The best way to learn about the legal profession is to talk to lawyers! What is it really like to argue a case before a jury? What skills does it take to make partner or own your own law firm? What should you know before joining the legal profession? Network with retired area lawyers representing a variety of legal careers to find out! Ask questions about what it’s really like to practice law and get insight into what skills you can build now to prepare for a successful legal career! This is a rare and valuable chance to talk to people who can share perspectives on their decades-long legal careers. No registration is necessary. Get an insider perspective on the University of Illinois College of Law! You are invited to a Google Hangout with the University of Illinois College of Law: Q&A with the Illinois Law Admissions Team TOMORROW, Tuesday, Oct. 27 from 11:00 am – 12:00 pm. Click this link to join! University of Chicago Law School invites Illinois students and alumni to attend their Open House on Monday, November 23 (during our Fall Break) from 9 am – 1 pm. The Open House will include a class and a tour of the school. You will also get to meet with the offices of Admissions and Financial Aid. To register, visit their website here. Michigan State University College of Law is offering webinars October 28 and October 29 on “Assembling Your Best Application” and “An Insider’s Guide to Law School”, respectively. Find out more and register here. New Student Programs is currently hiring Orientation Leaders. Attend the info session TODAY, Oct. 26 at 5:00pm at AACC on Nevada Street. Apps are due Oct. 29. Click here to find out more or to apply. The White House Internship Program is a unique opportunity to gain valuable professional experience and build leadership skills. This hands-on program is designed to mentor and cultivate today’s young leaders, strengthen their understanding of the Executive Office, and prepare them for future public service opportunities. Come learn about this competitive 3 1/2 month volunteer opportunity in Washington, DC, open to U.S. citizens from all majors and backgrounds, both graduate and undergraduate students. Applications for the Summer Internship cycle are due January 15th. Former White House Intern and Presidential Appointee, Rachel Rubin, will discuss the application process and program requirements, as well as share her experiences as an Illini serving President Obama’s administration. Interested? Come to an event on Wednesday, November 4 at 4:30 in Room 404 David Kinley Hall. And, see: The White House Internship: A Public Service Leadership Program, https://www.whitehouse.gov/participate/internships. Intersect – Learn skills in relationship building and team development. Saturday, November 7. Register at http://www.illinoisleadership.illinois.edu/. Scholarship alert: The YMCA is now taking applications for the Fred S. Bailey Internship Scholarship Program for U of I students who have an unpaid internship in spring. The University YMCA’s Fred S. Bailey Unpaid Internship Scholarship program provides scholarship funding to students who accept unpaid internships with public service agencies and not for profit organizations. Applications are due Nov. 13! For more information and to apply, go here: http://www.universityymca.org/bailey/internship_awards.html. Studying a less-commonly-taught language? Seeking linguistic and cultural immersion? Boren Undergraduate Scholarships provide unique funding opportunities for freshman through seniors to study language and culture in non-Western regions critical to US interests. Applicants must be U.S. citizens. The strongest candidates have a solid academic record and the potential to succeed in their proposed study abroad experience, as well as clear plans for how they will use the target language in their future academic and professional endeavors. Boren Scholars commit to working in the federal government for at least 1 year after graduation. The campus deadline is January 19, 2016. Please learn more about the campus process here. For complete information on Boren Awards preferred languages and countries, click here. This fellowship is available to both graduate and undergraduate students. Awards will be given for the summer and the academic year. The awards are for study in modern foreign languages in combination with area studies, area aspects of professional studies or international studies. The awards include tuition/fee payments and a generous stipend! Info sessions: Thursday, December 3 and Friday, December 4, 126 GLSIS, 4-5pm. For more information, visit http://publish.illinois.edu/illinoisflas/aboutflas. University of Illinois STEM (Science, Technology, Engineering & Math) students are especially invited to apply for Carlson Caspers Inclusion and Diversity Scholarship Program. October LSAT takers, today we have some important info to share with you about two topics: 1)Whether you should retake the LSAT in December, and 2) What you need to know about registration for December’s LSAT. Before we get to those topics, we want to hear from you! We invite you to click here to share how you prepped for the October LSAT in this short survey we are conducting. We will use the info to help advise future students about satisfaction with various LSAT prep options. Many people find themselves anxiously awaiting their October LSAT scores in order to decide whether to retake in December. Then they receive their score…and they still don’t know whether they should retake. What are the important elements to consider when making this decision? Is your score consistent with (meaning, within 2-3 points of) your practice test scores? If so, this suggests that you did demonstrate your ability and this score was not an anomaly. What is a realistic outcome of retaking? Here’s the data. The LSAC’s own data show that the average LSAT retaker scores within 2 points of what they scored on their first exam. In their study, 66% of LSAT retakers who originally scored a 155 improved, on average scoring a 157 on their second exam. However, 25% of those retakers did worse on their second LSAT, and 8% scored the same. What about Illinois’ LSAT retakers? To give you an even better idea of your retaking odds, we studied the data of Illinois students and alums and put it on our Pre-Law Compass page for you. (In Compass, click on LSAT Preparation and then Should you retake the LSAT?) For University of Illinois retakers, 53% scored an average of 2 points higher on a second LSAT, 15% of retakers scored worse and 7% scored the same. Nearly 25% of that group cancelled the score or were absent for that second LSAT. Do you have the time/energy/focus to consistently keep your LSAT prep going until Dec. 5? This is an especially important consideration for the December exam because it is around fall break/holidays, close to finals, and a time when many people need to fully focus on their academic work. It is very important that your academics do not suffer for the sake of your LSAT score. Do you want to apply Early Decision at any law school? Most Early Decision programs will not accept the December score, so this is an important factor. Want to talk it over? It can be helpful to talk with an advisor to help you weigh important factors in this decision. Feel free to make an appointment by calling 333-9669. As you may have noticed, the LSAC changed the December registration date to October 23. This can make it difficult for October takers, who won’t receive your score until October 28. UPDATE 10/23: The LSAC released the October LSAT scores early, on Oct. 22, so that October takers could have their score prior to the December deadline. Because of this early score release, they will no longer be offering refunds on late fees. THE REGULAR DEADLINE TO REGISTER FOR THE DECEMBER LSAT IS TODAY, OCTOBER 23. LATE REGISTRATION CLOSES NOVEMBER 3. On behalf of our LSAT takers, we have contacted the LSAC to request a change to upcoming registration dates so that students would have their LSAT scores MORE than 24 hours before registration is due. University of Illinois College of Law will host Raymond LaHood, former Department of Transportation Secretary, to deliver a “Bipartisanship in Government” lecture Friday, Oct. 23 from 12-1 in the College of Law Auditorium (504 E Pennsylvania Ave). This event is free and open to the public. Pre-Law students are invited to watch oral arguments for the U.S Court of Appeals for Veterans Claims on Wednesday, Oct. 28 at 9:30 a.m. in the College of Law Auditorium (504 E Pennsylvania Ave). This event is free and open to the public. Michigan State University College of Law is offering an upcoming webinar on Preparing for Law School. This webinar is designed for first and second year college students. Find out more and register here. New Student Programs is currently hiring Orientation Leaders. Attend an info session Wednesday, Oct. 21 at 5:00 at BNAAC East Gregory Street or Monday, Oct. 26 at 5:00 at AACC on Nevada Street. Apps are due Oct. 29. Click here to find out more or to apply. iSEE presents Sustainability Week 2015! Check out their website here for a variety of campus events and speakers. Researching law schools can be a difficult task. The amount of information available on the internet can be overwhelming. One resource that we have found can help in the research process is Law School Transparency (LST). 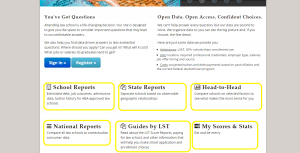 The website (http://www.lawschooltransparency.com/) provides a one-stop shop for various types of law school related information from job prospects to LSAT and GPA ranges. LST offers more sources of information than we can reasonably cover in this space, but we would like to give you a few pointers for navigating the site. Check out more of Law School Transparency when you have an opportunity. The site offers much more than what we have briefly shown you today. Take some time to play around on LST because it offers important information that may help you to make important decisions such as what law schools to apply to, where you are most likely to be accepted, and what schools will offer you the best chance of success as a student and beyond. On November 9, Pre-Law Advising Services and Osher Lifelong Learning Institute present a special opportunity for pre-law students to engage with legal professionals. The following lawyers, who represent a variety of legal practice specialties, will be here at 5:00 in 514 Illini Union Bookstore Building. Network with these lawyers, find out what the legal profession is really like, and learn about the skills you can be building now to make yourself a great advocate. Join us! This is a great opportunity to gain insight into the entire spectrum of professional legal life. Jim Kearns is currently an adjunct professor at the College of Law, teaching Pretrial Litigation. In 2010, after practicing for 35 years with Heyl, Royster, Voelker & Allen, the last 29 as managing partner of the Urbana office, Jim formally retired from active practice; he continues to handle select cases for the firm in an “of counsel” capacity. Jim’s practice with the Heyl firm was devoted to civil litigation, with emphasis for most of his career on trial of catastrophic injury cases in a wide variety of areas, including medical malpractice and products liability, as well as railroad, airline and trucking accidents. Jim has been involved in employment law and civil rights cases as well. During his active practice, Jim was a fellow of the American College of Trial Lawyers, and was regularly chosen by his peers as both a Leading Lawyer and a “Super Lawyer” in the area of civil litigation, designations limited to 5% of Illinois attorneys. Jim graduated from the University of Notre Dame in 1966, and, following a stint in the United States Army, from the University of Illinois College of Law in 1975. Marilyn B. Resch was in the private practice of law for 39 years, most of that time representing clients in family and marital issues. She retired from the active practice of law in December 2012. Prior to opening Resch Siemer Law Office, LLC in Effingham in September 2008 with Martin W. Siemer, Marilyn was a partner with the Effingham law firm of Siemer, Austin, Resch, Fuhr & Totten from 1976 to 2008. Before coming to Effingham in 1976, Marilyn worked for the National Labor Relations Board in Peoria and for the Illinois Attorney General’s Office in Springfield in the Environmental Division. When Marilyn came to private practice in 1976 she was one of the first female attorneys in the area. She soon developed an active family law practice, covering cases in at least eleven counties in Central Illinois. She handled numerous contested custody and property division divorce cases, post-divorce modification cases, including child support and visitation modifications, orders of protection proceedings, and paternity disputes. For more than 15 years Marilyn was also the City Attorney for the City of Casey. Marilyn was rated AV by Martindale Hubbell and for a number of years she was recommended by her peers for the Leading Lawyers Network. Timothy O. Smith, a 1970 (History) and 1973 (Law) graduate of the University of Illinois, practiced law in Danville, Illinois from 1977 until his retirement in 2010. During the last 13 years he was a sole practitioner. Prior to his arrival in Danville, Tim severed in the U S Navy’s Judge Advocate Generals Corps, first as Base Defense Counsel at NAS Oceana, Virginia Beach, Virginia, and then on the staff of the Judge Advocate General in Washington, D.C.. His Danville practice began as a general practice and over the years narrowed to banking, commercial transactions, business entities, estates, trusts, and complex creditor representation in bankruptcy. Pre-Law 101 (for Freshmen or students new to pre-law): TODAY Monday, October 12, 4:00-5:00 pm in IUB 504. This workshop is for any Illinois student who is new to pre-law. We will cover: What it means to be a pre-law student at Illinois; the profile of a successful law school applicant; building a pre-law resume during undergraduate years; and what helpful resources exist on campus. We will answer all of your pre-law questions! This workshop is primarily aimed at first year students but all students are welcome. First year students should attend a Pre-Law 101 prior to setting up an individual Pre-Law Advising appointment. Select any Pre-Law 101 session that suits your schedule–each covers the same material. Please register here. Are you applying to law school this year? This workshop will provide an extensive overview of the application process, including: Understanding the Credential Assembly Service (including a demo), letters of recommendation, transcripts, and the LSAC report that law schools receive. We will discuss how to develop a law school application strategy and share tips to maximize admission and aid in the law school application process. All of your questions about the law school application process will be addressed! No registration is necessary. This workshop does not cover the personal statement and law school application resume due to the separate workshops on those topics. Attendees are invited to attend both workshops. Pre-Law Black Law Students Association Chapter Information Meeting TODAY, Monday, October 12 at 7 pm in Lincoln Hall – Come learn about one of the newest RSO’s on campus, as they are very excited to offer various service opportunities and programs to serve the needs of ALL undergraduate students. For pre-law students specifically, BLSA hopes to be a voice and source of guidance into law school. Getting the Job: Interviewing Tips, Tuesday, October 13, 4-5 pm. Creating Powerful Resumes and Cover Letters, Tuesday, October 13, 5-6 pm. Finding an Internship, Wednesday, October 14, 5-6 p.m.
Ignite – Develop skills in leading change and understanding systems thinking. Will be held on Saturday, October 17. For more information on the event and to register, please visit: http://www.illinoisleadership.illinois.edu/. LeaderShape is a nationally-recognized leadership development program that takes place at many college campuses every year. At the LeaderShape Institute, participants learn how to lead with integrity through a variety of fun and educational experiences. They will create a vision for change focused on their organizations and an action plan designed to assist them in effectively implementing their vision and goals. The University of Illinois offers a campus-based session of this nationally recognized program each January. Unlike i-programs and workshops, students must apply for this program through their academic college Dean’s Office. For more information about LeaderShape, contact your academic college Dean’s Office. You may also contact the Illinois Leadership Center or view the Leadership Center events calendar to learn more about application deadlines and available information sessions. An information session will be held tomorrow, Tuesday, October 13 from 5:30 – 6:30 pm in the Bruce Nesbitt African American Cultural Center. To learn more about this program, please visit: http://www.illinoisleadership.illinois.edu/programs/leadershape.asp. The Harry S. Truman Scholarship awards $30,000 for students pursuing graduate degrees in public service fields. College juniors who are U.S. citizens with a record of community service and a commitment to a career in public service are eligible. Public service includes government, uniformed services, public interest organizations, non-governmental research or educational organizations, public and private schools, and other public service-oriented, non-profit organizations. Evaluators look for leadership ability, potential for influencing public policies, community service and extracurricular activities, suitability of the applicant’s proposed program of study for a career in public service, strong academic performance, and potential to perform well in a premier graduate school program. Truman Scholars have pursued many fields of study, such as agriculture, engineering, economics, education, government, history, global studies, law, political science, public administration, and public health. Illinois may nominate up to 4 students for the Truman Scholarship. More information on this award, including the campus endorsement process, can be found here. To make an appointment to discuss whether the Truman Scholarship is right for you, please contact us at topscholars@illinois.edu. Most applicants list the LSAT as the single most stressful part of applying to law school. But the item coming in at a close second is the personal statement. Why? Because people find it very difficult to write about themselves. Applicants have to navigate the fine line of showing the admissions folks that they are qualified without appearing to be on a turbo-charged brag session. So — what is it? The personal statement is a 2- to 3-page essay that, when done well, introduces who you are and tells the reader the unique qualities you bring to the institution while also highlighting your strengths and demonstrating strong writing skills. Naturally, opinions vary on what makes a great personal statement. Approach the personal statement from the perspective of the admissions committee. They may have 8 applicants or more for every available seat in their class and must now choose among a sea of highly competitive candidates. Give them a reason to choose you. DO sign up for one of our PLAS “Perfecting Your Personal Statement and Resume” workshops. We still have space in this week’s session, set for tomorrow, October 8, 12:30-1:30pm, 514 IUB. To attend this or another session, please register here. DO read each personal statement prompt from each school and respond to the question asked. DO begin working as soon as possible if you haven’t started already. DO make an appointment with a pre-law advisor to review your personal statement. If you’d like us to review your personal statement, we ask that you make an appointment and then email your statement to the advisor with whom you are meeting at least 2 days prior to it so that he or she is prepared to discuss it with you. After the appointment, we can offer feedback on revisions once more via email or in person. DO check and re-check for typos and grammatical errors. The law school admissions deans expect your personal statement to be ERROR FREE! DON’T write this the night before you plan to submit your application. The best essays take time and involve considerable revision from first draft to final submission. DON’T treat this as another résumé. There is no need to summarize your work or academic history by writing something like, “First I had this job, and then I got hired at this company.” You have the opportunity to do that in your résumé. Write with more detail about highlights and experiences at your jobs instead. For more tips and suggestions about the personal statement, check out the PLAS website and our Compass page. For an admissions perspective on the personal statement, you might want to take a look at this interesting and short video by Asha Rangappa, Dean of Admissions for Yale Law School. Chicago-Kent College of Law also recently posted a “Writing a Winning Personal Statement” tip sheet on its admissions blog that has some other good suggestions. Good luck and start writing! There is a lot going on this week, beginning with the 2015 Law School Fair, which is TOMORROW. Make sure you scroll all the way to the bottom to learn about a paid position, scholarship opportunities and more! Our biggest event of the year is almost here! Join us for the 2015 Law School Fair TOMORROW, Tuesday, October 6 from 10:00-2:00 at the Illini Union! Over 100 law schools will be here to visit with ALL students. Dress is business casual. It is not necessary to bring a résumé, but you may bring business cards. Most schools will have a sign-in sheet for you to provide your contact information if you wish. Bring your questions about the schools and their programs. Find out about joint degree programs. Ask about scholarships. Talk with admissions reps about what law schools are looking for. Ask questions, collect some freebies and fee waivers, and learn about law school admissions from the experts. For more details like who’s coming and what to expect, check out our website. See you there! Perfecting Your Personal Statement & Resume for Law School: Thursday, October 8, 12:30 – 1:30 pm in IUB 514. Curious about what you can do with your undergraduate degree? This is your chance to hear from English and Creative Writing alumni with experience in law, education, politics, entrepreneurship, publishing, fundraising, communication, PR, and web design. We’ll have refreshments and plenty of time for Q&A. We welcome students in all majors to one of our most popular annual events! RSVP at https://illinois.edu/fb/sec/7170247. We hope to see you there! The Critical Language Scholarship (CLS), from the U.S. Department of State, is a fully-funded, intensive overseas language and cultural immersion program for American undergraduate and graduate students in ALL fields. The CLS institutes cover one academic year of university-level language coursework in 8 to 10 weeks over the summer, and include cultural programming, local language partners, and excursions. Participants receive academic credit at their U.S. institutions. Applicants must be U.S. citizens at least 18 years of age and enrolled in a degree-granting program at the undergraduate or graduate level. Our advisors, who have served as national-level CLS reviewers, will provide an overview of the program and give you helpful guidance on how to put together a competitive application. You will also hear from Illinois CLS alumni who spent summer 2015 in overseas language institutes on the scholarship. For more information, please visit: http://www.clscholarship.org/. Apply to Become an I-Connect Facilitator — Apply BEFORE October 9! Are You Passionate About Diversity and Inclusion? Will you like to help make change on your campus? Become an I-Connect Facilitator!!! Diversity and Social Justice Education is looking for undergraduate students to facilitate I-Connect Diversity and Inclusion Workshops starting in Spring 2016. The I-Connect Diversity and Inclusion Workshop is an initiative of the Office of Inclusion and Intercultural Relations, and the Division of Student Affairs. Students of color, LGBTQ students and allies, international students, and students with disabilities are highly encouraged to apply. Students of diverse backgrounds will be able to use their to use their positionality and their unique perspectives to guide new students to understand and accept diversity and inclusion not only on the University of Illinois campus, but in their personal and professional lives as well. Experience facilitating difficult conversations is a must! The position is paid, and interviews will be held in mid-October. The Kevin T. Early Memorial Scholarship ($2,000) is open to freshman students who demonstrate an aptitude for writing poetry. To apply, submit 5 poems by Oct. 30 to Jennifer Price, Department of English, jajones6@illinois.edu. Include your name, address, phone number, email, and UIN on a title sheet with your submission. Do not include a name on the poems themselves. Career Fair Prep: Maximizing Your Experience Tues, Oct 6, 4-5pm. This Wednesday, Oct. 7 from 10:30-12:30, watch the Illinois Fourth District Appellate Court hear oral arguments for both a criminal and a civil case at the College of Law (Rowe Auditorium).